01. This standard aims to prescribe and guide the principles and methods of accounting the effects of changes in foreign exchange rates, applicable to enterprises which have foreign currency transactions or overseas activities. Foreign currency transactions and financial statements of overseas activities must be converted into the enterprises’ accounting currency, including initial recognition and reporting on the balance sheet date; recognition of the foreign exchange rate difference; and conversion of the financial statements of overseas activities as a basis for making entries in accounting books, making and presenting the financial statements. b/ The conversion of the financial statements of overseas activities for inclusion of these statements in the financial statements of the enterprises by the inclusion or owners’ equity method. 03. 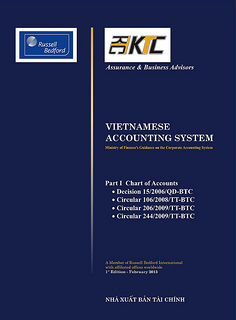 Enterprises must use Vietnam dong as an accounting currency, unless they are permitted to use another common currency. 04. This standard does not prescribe the conversion of an enterprise’ financial statements from an accounting currency into another so as to facilitate the users that have been accustomed to the such converted currency or for similar purposes. 05. This standard does not mention the presentation of cash flows arising from foreign currency transactions and from the conversion of cash flow statements of an overseas activity in the cash flow statements (prescribed in the standard "Cash flow statements"). Overseas activities are branches, subsidiaries, partnerships, joint-venture companies, business cooperation, and business association of the reporting enterprises, which operate in countries other than Vietnam. Foreign-based establishments means activities in foreign countries, which operate independently from the reporting enterprises. Accounting currency is a currency officially used in the making of accounting entries and financial statements. Foreign currency is a currency other than the accounting currency of an enterprise. Exchange rate is the rate of exchange between two currencies. Exchange rate difference is the difference arising from the actual exchange or conversion of the same amount of a foreign currency into the accounting currency at different exchange rates. Closing exchange rate is the exchange rate used on the balance sheet date. Net investment in a foreign-based establishment is the portion of capital of the reporting enterprise in the total net asset of such foreign-based establishment. Monetary items are current cash and cash equivalents, receivables or liabilities in fixed or determinable cash amounts. Non-monetary items are items other than monetary items. Reasonable value is the value for which an asset can be exchanged or the value of a liability which may be settled voluntarily between knowledgeable parties in the par value exchange. e/ Uses a currency for purchasing, selling or exchanging for another currency. 08. A foreign currency transaction must be accounted and initially recognized in the accounting currency by applying the exchange rate between the accounting currency and the foreign currency on the date of the transaction. 09. The exchange rate on the date of the transaction will be regarded as spot exchange rate. Enterprises may use an exchange rate that approximates the actual exchange rate on the date of the transaction. For example, the average exchange rate of a week or a month may be used for all transactions in each kind of foreign currency arising in such week or month. If the exchange rate fluctuates greatly the enterprises must not use the average exchange rate for the accounting work in the accounting week or month involved. c/ Non-monetary items determined according to the reasonable value in foreign currencies must be reported at the exchange rate on the date of determination of the reasonable value. 11. The book value of an item will be determined in accordance with the relevant accounting standards. For example, inventories will be determined according to their original prices, fixed assets according to their historical costs even if their book values has been determined on the basis of the original prices, historical costs or reasonable values, the determined book values of items of foreign currency origin will then be reported in the accounting currency in accordance with the provisions of this standard. a/ At the construction investment stage to form fixed assets of newly established enterprises, the exchange rate difference arising upon settlement of monetary items of foreign currency origin for making construction investment and the exchange rate difference arising upon re-valuation of monetary items of foreign currency origin at the end of the fiscal year will be reflected accumulatively and separately on the balance sheets. When completely constructed fixed assets are put into use, the exchange rate arising at the construction investment stage will be amortized into income or production and business costs over the maximum period of five years. b/ At the stage of production and business, including the construction investment to form fixed assets of the operating enterprises, the exchange rate difference arising upon settlement of monetary items of foreign currency origin and re-valuation of currency of foreign currency origin at the end of the fiscal year shall be recognized as income or costs in the fiscal year, except for the exchange rate difference prescribed in paragraphs 12c, 14 and 16.
c/ For enterprises using financial instruments for exchange rate risk reserve, all loans and liabilities of foreign currency origin shall be accounted according to the actual exchange rate at the time they occur. Enterprises must not re-valuate loans and liabilities of foreign currency origin for which they have used financial instruments for exchange rate risk reserve. 13. The arising exchange rate difference shall be recognized when the exchange rate changes between the transaction date and the date of settlement for all monetary items of foreign currency origin. When transactions occur and are settled in the same accounting period, exchange rate differences will be accounted in such period. If transactions are settled in subsequent accounting periods, exchange rate differences will be calculated on the basis of the change in the foreign exchange rate in each period till the period during which such transactions are settled. 14. Exchange rate differences arising from monetary units of foreign exchange origin, which, in nature, belong to the reporting enterprises’ portion of net investment in foreign-based establishments shall be classified as owners’ equity in the enterprises’ financial statements till such investment is liquidated. At that point of time, all these exchange rate differences will be accounted as income or cost in accordance with paragraph 30. 15. An enterprise may have monetary items receivable from or payable to a foreign-based establishment. An item the settlement of which is not determined yet or is unlikely in an anticipated duration in future will, in nature, result in an increase or decrease in the enterprises’ net investment in such foreign-based establishment. These monetary items may include long-term receivables or loans but not commercial receivables and commercial payables. 16. Exchange rate differences arising from liabilities of foreign currency origin, which are accounted as an amount for restricting risks of the enterprise’s net investment in a foreign-based establishment, will be classified as owners’ equity on the enterprise’s financial statements till the net investment is liquidated. At that point of time, these exchange rate differences will be accounted as income or cost in accordance with paragraph 30 . 17. The method of conversion of the financial statements of overseas activities will depend on their financial and operational dependence on the reporting enterprises. For this purpose, overseas activities shall be classified into two types: "Overseas activities inseparable from the operations of the reporting enterprises" and "foreign-based establishments." 18. Overseas activities inseparable from the operation of the reporting enterprises shall conduct their business operations as a component of the reporting enterprises. For example, the foreign-based enterprises sell imported goods and transfer the proceeds therefrom to the reporting enterprises. In this case, any change in the rate of exchange between the reporting currency and the currency of the foreign country where activities are carried out shall directly affect the cash flows from the reporting enterprises’ operation. Therefore, changes in the exchange rate will affect each specific monetary item of overseas activities more than the reporting enterprise’s net investment in such activities will. 19. Foreign-based establishments are independent business units, having the legal person status in the host countries and using the currencies of the host countries as their accounting currencies. These establishments may participate in foreign currency transactions, including transactions in the reporting currency. Any change in the rate of exchange between the reporting currency and the currency of the host country will only slightly affect or not directly at present or in future cash flows from the operations of the foreign-based establishments as well as of the reporting enterprises. Changes in the exchange rate will affect the reporting enterprises’ net investment more than specific monetary or non-monetary items of foreign-based establishments. f/ Cash flows of the reporting enterprise are separate from the daily operation of overseas activities and are not directly affected by the operation of overseas activities. The reasonable classification of each overseas activity may be based on the above-said characteristics. In some cases, the classification of an activity carried out abroad as a foreign-based establishment or an overseas activity inseparable from the reporting enterprise may be unclear, it is, therefore, necessary to evaluate such activity to ensure reasonable classification thereof. 21. The financial statements of overseas activities inseparable from the operation of the reporting enterprises will be converted under the provisions in paragraphs 7 to 16 as for operations of the reporting enterprises. 22. Each item in the financial statements of overseas activities will be converted like transactions of overseas activities conducted by the reporting enterprises. The historical costs and depreciation of fixed assets will be converted at the exchange rate on the date the assets are purchased. If the assets are calculated according to their reasonable values, the exchange rate on the date such reasonable values are determined will be used. The value of inventories shall be converted at the exchange rate of the time such value is determined. Recoverable amounts or realizable values of an asset will be converted at the actual exchange rate at the time these amounts are determined. 23. In practice, an exchange rate that approximates the actual exchange rate on the date on which the transaction occurs is often used. For example, the average exchange rate in a week or a month may be used for all foreign currency transactions occurring in such period. However, if the exchange rate fluctuates greatly, the average exchange rate for the period cannot be used. c/ All exchange rate differences arising upon the conversion of the financial statements of foreign-based establishments for inclusion in the financial statements of the reporting enterprises must be classified as owners’ equity of the reporting enterprises till such net incomes are liquidated. 25. Where the average exchange rate approximates the actual one, it will be used for converting the items of revenues, other incomes and costs of foreign-based establishments. b/ Conversion of net investments at the beginning of a period in foreign-based establishments at an exchange rate other than the exchange rate already used in the previous period. c/ Other revised items related to the owners’ equity in foreign-based establishments. These exchange rate differences shall not be recognized as income or cost in the period. They often exert little or indirect impact on cash flows from present and future activities of foreign-based establishments as well as of reporting enterprises. When a foreign-based establishment is consolidated, which, however, does not result in entire ownership, the accumulated exchange rate difference arising from the conversion and associated with the minority shareholders’ investments in the foreign-based establishments must be amortized and reported as part of ownership of minority shareholders at the foreign-based establishments in the consolidated balance sheet. a/ Assets and liabilities of foreign-based establishments will be converted at the closing exchange rate as prescribed in paragraph 23.
b/ Assets and liabilities of the reporting enterprises already denominated in the reporting foreign currency, or non-monetary items will be reported at the exchange rate on the date of the transaction as prescribed in paragraph 10 (b). 28. The inclusion of the financial statements of foreign-based establishments in those of the reporting enterprises must comply with the common inclusion procedures, such as exclusion of balances in a group and a subsidiary’s operations with companies in the group (see the accounting standard "Consolidated financial statements and accounting of capital contributed in subsidiaries" and the accounting standard "Financial information on capital contributions to joint ventures"). However, an exchange rate difference arising in a monetary item in the group, whether short-term or long-term, cannot be excluded into a corresponding item in another balance in the group because this monetary item demonstrates the commitment to convert one foreign currency into another foreign currency, thus giving rise to a profit or loss to the reporting enterprise as a result of the change in the foreign exchange rate. Therefore, in the consolidated financial statements of the reporting enterprises, exchange rate differences shall be accounted as income or as cost, or if they arise from the cases mentioned in paragraphs 14 and 16, they shall be classified as owners’ equity till the net investments are liquidated. 29. The financial statement dates of foreign-based establishments must match the financial statement dates of the reporting enterprises. Where financial statements cannot be made on the same day, it is permitted to consolidate financial statements with dates differing within three months. In this case, assets and liabilities of foreign-based establishments shall be converted at the exchange rate on the date of the balance sheets of foreign-based establishments. Where the exchange rate on the date of the balance sheet of a foreign-based establishment differs greatly from that on the date of the financial statement of the reporting enterprise, an appropriate adjustment must be made from such date to the date of the balance sheet of the reporting enterprise according to the accounting standard "Consolidated financial statements and accounting of capital contributed in subsidiaries" and the accounting standard "Financial information on capital contributions to joint ventures." 30 When liquidating foreign-based establishments, the accumulated exchange rate differences already postponed (under the provisions in paragraph 24.c) and related to such foreign-based establishments will be recognized as income or as costs in the same period during which profits or losses from the liquidation are recognized. 31. An enterprise may liquidate its investment in a foreign-based establishment by selling, auctioning, repaying equities or abandon all or part of its capital in the establishment concerned. Settlement of dividends is a form of liquidation only when it is a recovery of investment. For partial liquidation, only the accumulated exchange rate difference related to owners’ equity can be calculated as profit or loss. The recording of a decrease in the accounting value of a foreign-based establishment will not constitute partial liquidation. In this case, no profit or loss regarding the postponed exchange rate difference shall be recognized at the time a decrease is recorded. 32. When there is a new classification of overseas activities, the provisions on conversion of the financial statements of overseas activities will apply from the date of the new classification. 33. Overseas activities may be re-classified upon the change in the degree of financial and operational dependence on the reporting enterprises. When overseas activities constitute a part inseparable from the operation of the reporting enterprises are classified as foreign-based establishments, the exchange rate difference arising from the conversion of non-monetary assets will be classified as owners’ equity on the date of the re-classification. When a foreign-based establishment is classified as an overseas activity inseparable from the operation of the reporting enterprises, the converted values of non-monetary asset items on the date of the conversion shall be regarded as their historical costs in the period during which the change occurs and in subsequent periods. Postponed exchange rate differences will not be recognized as income or cost till the liquidation of the activities. b/ The net exchange rate difference classified as owners’ equity (according to paragraphs 12a and 14) and reflected as a separate portion of the owners’ equity and the exchange rate differences at the beginning and the end of the period must be presented. 35. When the reporting currency is different from the currency of the country where the enterprises are operating, the enterprises must clearly state the reason therefor, even when they change the reporting currency. d/ Impacts on the net profit or loss of the previous period, which affect the classification occurring at the beginning of the nearest period. 37. The enterprises must present the selected method (as prescribed in paragraph 27) for converting the adjustments of the value of commercial advantages and the reasonable value arising in the purchase of foreign-based establishments.